The most efficient and economical data protection method for enterprise and SMBs remains to be RAID technology. Using RAID has two advantages – high availability and better performance. 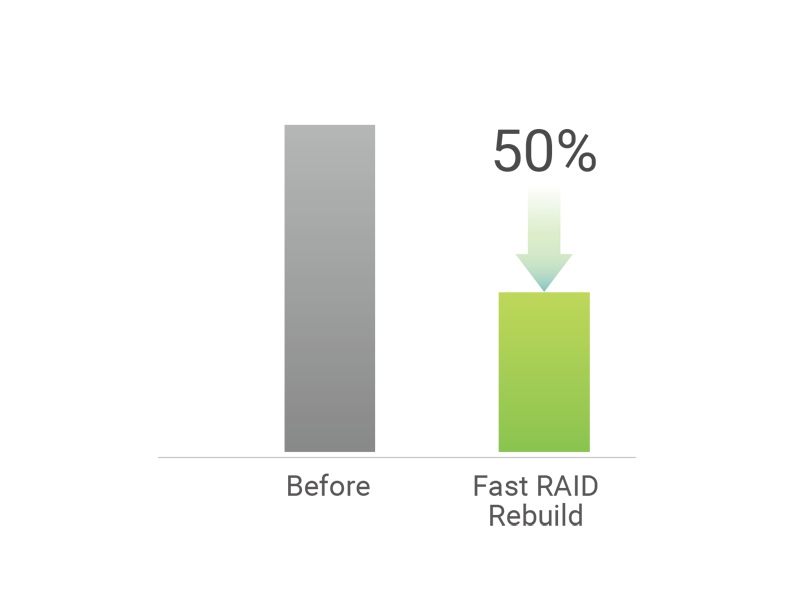 SANOS supports complete RAID levels including RAID 0, 1, 0+1, 3, 5, 6, 10, 30, 50, 60, N-way mirror, and also RAID EE technology including RAID 5EE, 6EE, 50EE, 60EE for reducing the long rebuild risk. You can choose the appropriate RAID level to best suit the application requirements. The XCubeSAN storage system will automatically recognize and locate member disks of a pool among enclosures. If you set a RAID group to offline in order to relocate the disk drives to another enclosure, there is no need to insert the disk drives at the exactly same slot as it was in the previous enclosure. Therefore, you don’t need to purposely make room for the roaming disks on the target enclosure by moving disks, you can add them anywhere slots are vacant. As disk capacities of 8TB and larger become more commonplace, RAID rebuilding times become longer. The industry standard is 1TB per hour, so a full-driver or RAID group rebuild can take hours or even days to complete. QSAN fast RAID rebuild technology analyzes the volume structure by isolating data blocks and free blocks, so in the event of a failure the storage system will only rebuild the area of the RAID array in use. The Fast RAID rebuild feature also includes metadata maintenance operations to intelligently detect blocks that are no longer in use. This practice can reduce RAID rebuilding time by 50% or more. QSOE, one of SANOS 4.0 software modules, can optimize communication centric processes to reduce protocol overheads, increase session scalability and therefore increase total I/O throughput. As a result, iSCSI throughput can be boosted up to 1.5 times and Fibre Channel throughput up to 1.6 times.